As the global water crisis worsens every year, the demand for a solution increases. Water is not running out, but every year more of us are sharing it. Additionally, drought, contamination, and pollution are serious problems worldwide. Air-to-water technology will provide a solution to the world’s water crisis, as water becomes the most valuable commodity on the planet; you could be part of the solution. Purifying a depleting water supply is not a solution. There’s an abundance of water around us in the air we breathe. With the advancement of Skywater®’s advanced air-to-water technology, water is extracted from the humidity in the air and does not deplete the existing water supply. Water vapor can continue to be extracted from the air indefinitely without impacting the planet. Using Skywater® will contribute to the reduction of the carbon emissions by eliminating the need and added expense of bottling and transporting water. Perfect for Home and Office works indoor or outy and produces fresh water up to 100 liters a day. 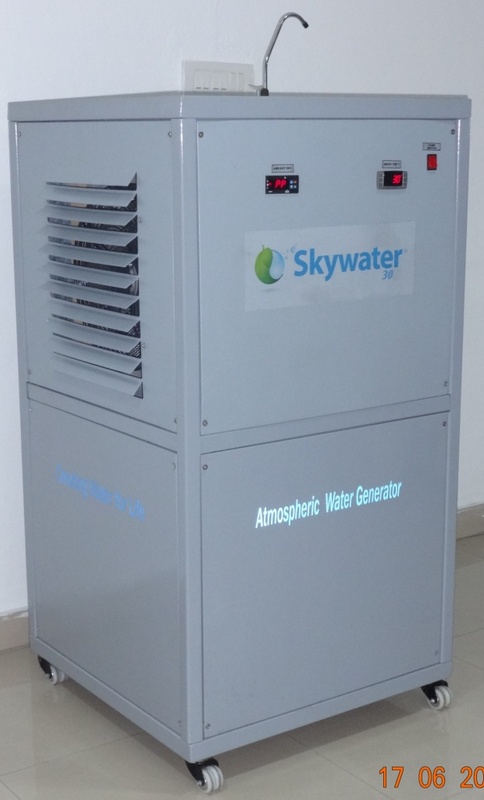 Skywater Alternative Energy water making machines, are designed with lower power consumption requirements, so they are ideal for operating with alternative energy products, such as solar, wind turbines and biofuel gasifiers. Gasifiers are particularly useful in a natural disaster situation where debris can be quickly converted into electric fuel, which in turn powers atmospheric water generation. Biofuel-Gasifiers (pictured right), are being used in remote villages in India to generate electricity for air to water production. Skywater alternative energy water making machines are ideal for remote locations lacking infrastructure. 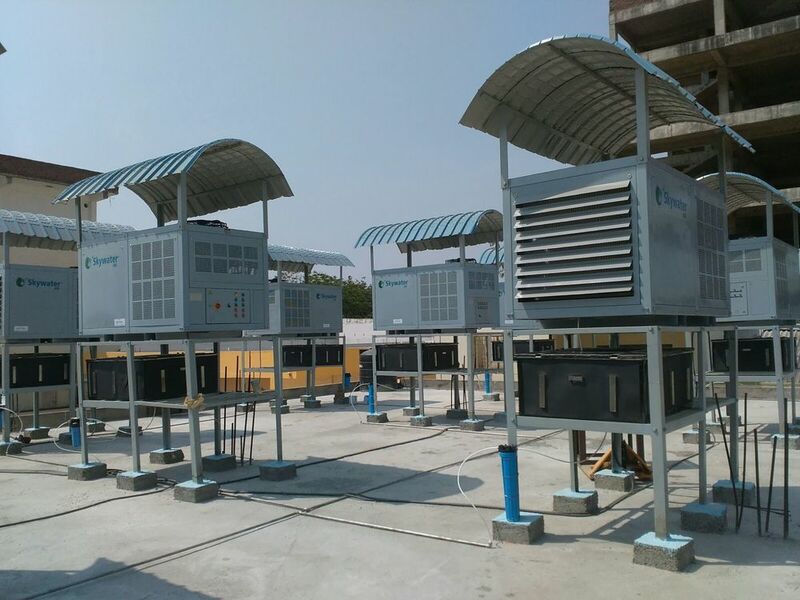 With adequate humidity of approximately 50% and warm temperatures of 75º F, the machines are designed to supply over 100 gallons (378 liters) of fresh drinking water from the air. Skywater’s Emergency Service Unit (ESU-20) is a crisis ready, emergency water generator that can deliver up to 900 gallons of pure drinking water daily. 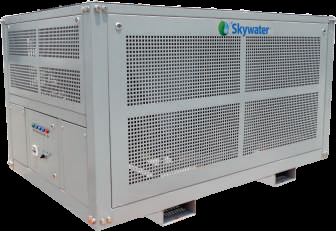 Skywater® ESU-20 contains 3 Skywater® 300 atmospheric water generators, a 1275 gallon water storage tank equipped with advanced secondary water filtration, and a 30kw electric diesel generator housed within a customized Featherlite® 20’ft mobile container. fresh drinking water from water vapor in the air. Skywater’s adiabatic distillation process is unmatched in water vapor harvesting, converting available atmospheric humidity in the air into water. 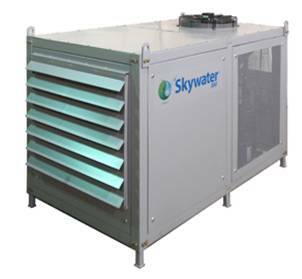 In an average range of temperatures and humidity levels, the Skywater® ESU-20 will produce anywhere from 450 to over 900 gallons of water per day. Island Sky® has customized the Skywater® 300 to military specification to be durable and dependable even in the toughest conditions. Reinforced with a protective exoskeleton, neoprene shock-absorbing gaskets and support structures on all internal components ensures durability. Rugged steel, and quality construction goes into the engineering of this cutting-edge technology to provide governments and humanitarian relief workers with an advantage over any other, an efficient, mega-source of pure water. Skywater® 300 military grade units have been studied and used by the United States Army, Italian armed services, the Indian Army as well as the Venezuelan Army. With 1 gallon of JP8 military grade diesel fuel the Skywater® 300 military unit can produce 10 to 14 gallons of water per hour. * Skywater® mobile machines eliminate most expenses associated with the current systems used to bottle, store and transport water to remote areas.